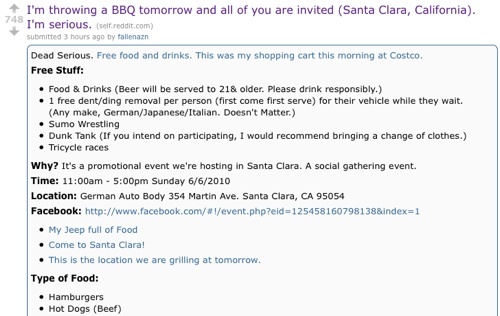 He posted some photos of the food he bought, his repair shop, tied it into a Facebook event so that people can spread the event around to their friends, and best of all … offered a “free dent/ding removal per person” during the party — free samples are huge and a great way to earn new customers. The obvious question is, Does Reddit have enough users in the Santa Clara area to have made this worth the guy’s time/effort? Even if not, he’s created goodwill in a social media community that will likely reward him to some degree with links and future buzz. 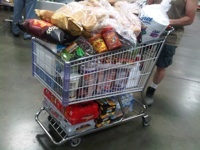 All that for a case full of food and an afternoon doing some free dent repair. Not too shabby if you ask me. This is a great article! It just goes to show you how social media can help boost your customers ultimately raising sales! Every small business should implement a little bit of this. I think the thing this shows is how the world of marketing is changing very quickly – how well this worked is down to how many people saw it in a small area in a short space of time, like you said, but it could open up a whole new world of ‘local viral marketing’ – it works really well on a bigger scale, so why not?. I love this! Weather or not it turns into a big event or just a burn out, it doesn’t matter because now he has moral standing in the community. At least with the people that did find out about it, and I think that networking like that goes a long way. Very inventive, and how very low risk, what’s the worst that could happen, he’s got enough food to last him a couple of weeks. I’m curious how many people showed up though? the guy’s a genius. what a fun way to market to potential local customers. Results, ROI, etc., where is it? Another story about generating buzz with no follow up on results. Not unlike online sweepstakes, it’s REALLY EASY to get people to show up for FREE STUFF. Social Media kids, we need CUSTOMERS. What was the end result in CUSTOMERS. Moral Standing, links, and buzz does not pay the bills and feed the family. Website traffic is EASY to get, making money from it is not. Running a small business is not a party, it’s hard work and we want to see results. Customers and Revenue – show us, social media gurus and fans, then we’ll spend more on it. I haven’t had time to follow-up, Paul, but was hoping someone else would get in touch with the guy and write a post about it. Would love to read more about what happened. But I still give him points for trying something unique. Yeah, I think the creativity is really cool too. It would be great to see him do it monthly or something, and track the results, it might be very effective.